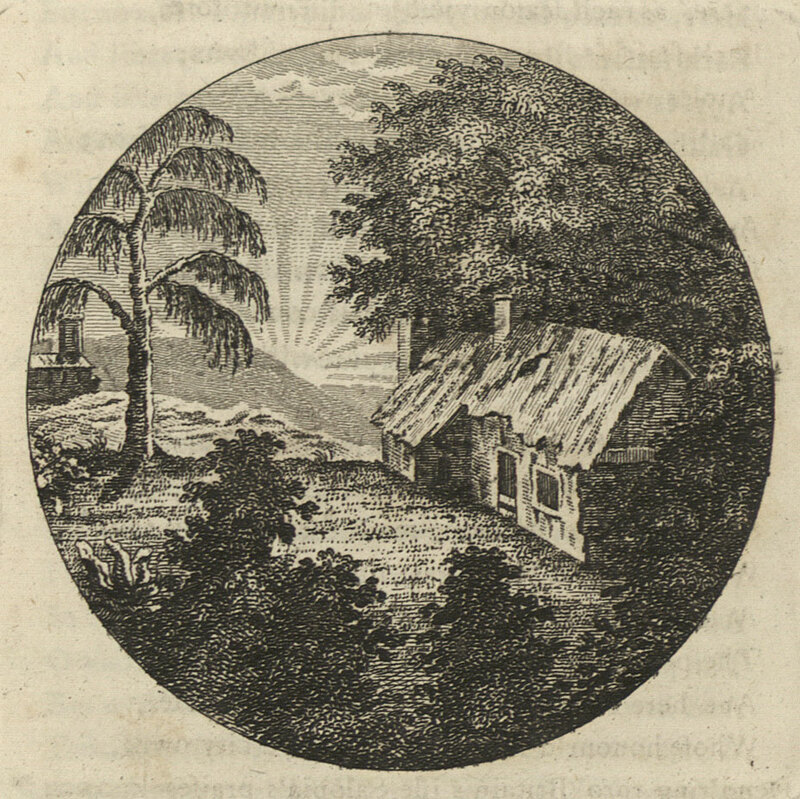 Image: An engraving of a harmonious rural landscape with a cottage and church. The idealised nature of the scene is enhanced by the light of the sun. From The Works in Verse and Prose of William Shenstone, Esq, Vol. I, Second Edition (London, J Dodsley, 1765), p 332. This stanza is telling. It echoes the ancient classical ideal of the virtuous, wise man choosing a simple, pastoral, yet cultured, life in the country, rather than live in the corrupt and corrupting city. (‘Augusta’ was London.) The ‘trees’ and ‘fountains’ suggest the woods, natural springs and streams to be found among Shenstone’s own hills and valleys. The above quotation from Graves mentions ‘pastoral ballads’. Much of Shenstone’s poetry was pastoral; indeed, one poem was entitled ‘A Pastoral Ballad’. Moreover, one of Shenstone’s collaborative literary projects was with the Reverend Thomas Percy, collecting and ‘arranging’ (i.e. altering) poems, many of them ballads, older or eighteenth-century, for what was eventually published in 1765, under Percy’s name, as Reliques of Ancient English Poetry. That Shenstone’s contribution to this was greater than sometimes acknowledged is shown by Marjorie Williams in her edition of Shenstone’s Letters. Reliques was influential in increasing interest in ballads among the literate classes. Consider, for example, the ballads of some of the Romantic poets. 5 The Poetical Works of William Shenstone, edited by Charles Cowden Clark. (Edinburgh, William P Nimmo,, 1868) p 1.